For those of you following along with this year’s book “Feel the Fear and Do It Anyway” by Susan Jeffers, PhD, here’s a bit of Chapter 2. In the process of Dr. Jeffers working through her fears she realized five truths about fear. Of the five, truth #5 impacted me the most. Would I rather push through the fear (empowered) or wait to have whatever I fear happen to me unexpectedly (victim). If we put off something that we fear, it’s always there nagging away at us, both consciously or unconsciously. We lull ourselves into this false sense of security when we ignore it…yet it’s always there…lurking…henceforth we’re at the mercy of the fear. I’ve been putting off promoting my mandala readings on Etsy.com for fear of being rejected or ridiculed for offering something so “out-there” in the mainstream market. In the end, all I’m doing is giving my power away (victim). As I color section 2, my intention is to work through this fear of what others think and move forward with offering readings on Etsy…in other words, be honest and forthright about who I am and what I do. What fear will you work through this month? Ponder this as you color section 2. When coloring with markers, especially on paper that is not suited for wet media, put a little color down at a time. Otherwise, the paper turns into a pulpy mess. I usually put some color down in one area, then put some color down in another area while the first area dries…usually takes about 1-2 minutes unless I put a lot of color down. Once the first area is dry then I go back and add some more color. For example with last month’s section…in the big blue area, I used the fine tip of my maker to put down some squiggly lines. When it was dry I used the brush tip of a light blue marker and ‘washed’ over the whole area. Creates an interesting effect and the paper stays intact. Please feel free to share your experience with coloring this section of the 2012 moty. I’d love to hear about your progress. And if you’re feeling particularly brave, send an image of your coloring. 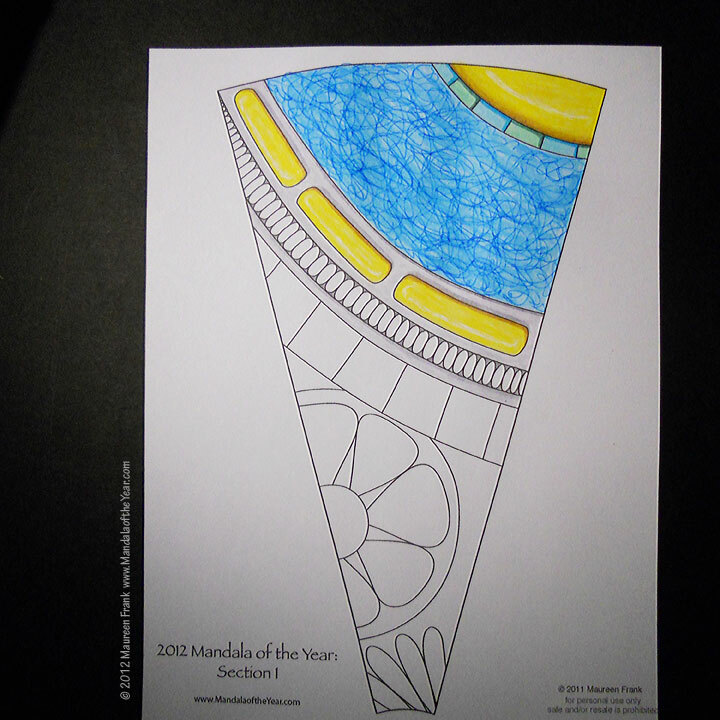 Be sure to download/color the February 2012 Mandala of the Month.